The Shure PGA48-XLR is a professional quality microphone from the PG Alta series and is ideal for spoken word and karaoke performance applications. 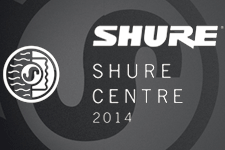 With the PG ALTA™ Microphone family, Shure continues its 90-year tradition of manufacturing audio products of the highest quality and construction. Featuring a sleek black metallic industrial design and cardioid polar patterns that reduce feedback and background noise, the PG ALTA family delivers rock-solid sound and reliability that sets the bar for accessible, professional-calibre gear for performance and recording.